There are many reasons for an investor to avoid Exxon stock, but I only need just one. On June 2, 2016, investment banker Merrill Lynch downgraded ExxonMobil (NYSE:XOM) stock to neutral. With that rating, fewer than a third of the 25 analysts who follow ExxonMobil (according to data from S&P Global Market Intelligence) now believe the stock is a buy. Why? Perhaps it has something to do with the fact that last quarter , ExxonMobil saw its revenues slump nearly 29%, and its profits collapse by more than 63%. And perhaps that has something to do with the fact that last quarter, global oil prices plunged to their lowest levels seen in the last 10 years . Rebounding in the second quarter to top $50, oil prices have recently resumed sinking under the weight of record oil inventories, the prospect of new supplies coming online from Iran, and the ready supply of easily accessible "fracked" crude in the U.S. All of this adds up to miserable prospects for oil price increases any time in the near future, and miserable prospects for ExxonMobil's profits growing as well. 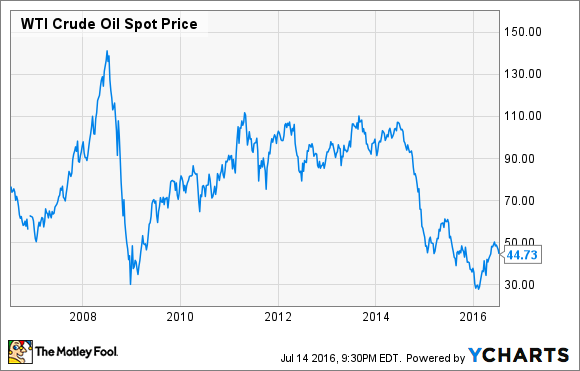 Oil prices have been going down, and taking ExxonMobil's stock price down with them. WTI Crude Oil Spot Price data by YCharts. ExxonMobil is the world's fourth largest oil company , and the biggest oil major based in the United States. Even with oil selling for pennies on the dollar relative to what it used to be worth, ExxonMobil managed to do more than $236.8 billion in revenues last year, and earned more than $16.1 billion in profit. But profits aren't Exxon's problem. Data source: S&P Global Market Intelligence. Image source: Author. You see the problem? Free cash flow -- cash profits -- are expected to fluctuate somewhat more widely year to year, than a company's smoother, GAAP-certified "net income." But over time, the two numbers should converge, and roughly equal out . That's not the case at ExxonMobil however -- or at archrivals Chevron (NYSE: CVX) or ConocoPhillips (NYSE: COP) either. While there are occasional instances when free cash flow (operating cash flow minus capital expenditures plus cash from divestitures) may exceed net income slightly, it's much more common to see net income overstate free cash flow -- and not by a little. All across the oil and gas industry, and over long periods of time, "profit" numbers consistently overstate real cash profitability. One analyst has commented that the problem arises "when the difference [between net income and free cash flow] is persistent over time. ... There are many possible explanations for persistent divergences." One such explanation is that "capital investment made in the past is not generating sufficient returns [and] deprecation assumptions ... don't accurately capture the value of the investment in net income." Translation: It costs a lot of money to build the infrastructure needed to take oil out of the ground. Ideally, Exxon, Chevron, and Conoco should be able to cover these costs and make a good profit by selling the oil once it's been extracted -- and in fact, these companies do usually earn profits from their businesses. What their cash statements and free cash flow numbers confirm, though, is that the cash profit they earn isn't nearly as rich as is represented on their income statements. Simply put, Exxon and its peers aren't as profitable as they look. That's why when I look at Exxon's most recent financials, it's not the profits dwindling to $16.2 billion (or the 30 P/E) that scares me. It's the fact that with free cash flow plummeting to $6.2 billion, and Exxon trading at a market capitalization of $394 billion, Exxon costs more than 63 times free cash flow today. That's too much to pay, and it's the one simple reason I won't buy ExxonMobil stock today.